Published in the Dover Express, 8 May, 1981. This deed was executed at Buckland, on the 10th of December, 1451, and witnessed by John Gibbes, John Coke, and others. The deeds refer to the appurtenances of the land in question, which might have included the mill buildings. It is also stated that the giver of this land had other land and tenements there, and seeing that the deed was executed on the spot, it seems possible that Dionisia Ive had her residence there. A century later, when the Maison Dieu was dis-established, the Master and Brethren were possessed of five acres of land in this Brox-Ditch Meadow; therefore, it may be presumed that, before her death, Dionisia Ive gave the remainder of this meadow to the Maison Dieu, of which Thomas Ive, living at the same period, seems to have been one of the Brethren. At that time London Road did not exist, the King’s Highway to Canterbury being then on the eastern side of this land; but there was a highway crossing from Barton, and passing through Buckland Bottom up to. St Radigund’s Abbey, skirting the south-west side of these Mill lands. After the dissolution of the Maison Dieu, these mill lands appear to have been in the hands, successively, of many persons, most of whom seem to have been millers. Particulars of ownership from the reign of Henry VIII down to the Restoration, are not recorded in the title deeds, which were, in 1906, in the possession of the Harding family. The earliest names are in an indenture between John Randall and William Stratfold. Randall. appears to have acquired the property about 1660, and dying not long afterwards, his widow, Alice, carried the property by marriage to William Beechinge, of Dover, cordwainer. Whether the cordwainer continued the milling business is not recorded; but the probability is that it passed into other hands, for, during the next 74 years, there were several owners, joint and otherwise, including Harrison, Egerton, Chesterton, Lamper, Marsh, Kennett, Kite, Payn, Greenhill, Sharp, Bean, Robbins, Friend, Bromley, Gibbon, Boykett, Hatton and Chester, many of them being well known Dover names. In 1740 the property was in the hands of William Wood, who was a large landowner. In 1777, Ingram Horn, who was a paper manufacturer, possessed this mill. In 1795, Williams Phipps appears to have been in possession erf the mill, in conjunction with Samuel Latham, the banker, and Peter Fector, another Dover banker, who, probably, had a joint interest, and assisted William Phipps in taking over the paper mill. The adjoining land, from the mill down to Bartholomew's Close, was, in the year 1788, the property of Sir Thomas Hyde Page, Kt., Military Engineer, who was knighted in 1783. Sir Thomas carried out important works in Kent during the American War, more particularly at Dover Castle, the Western Heights, and shore batteries; and in 1779 he raised and organised the Dover Association, which was the first volunteer force in the Kingdom. 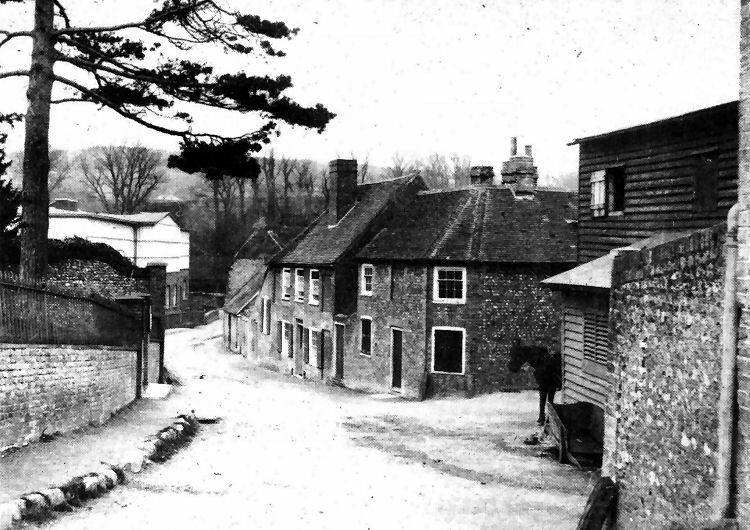 He resided on his property at Buckland, until the death of his wife Dame Albina Page in 1804, when he moved to Dorking. The large, walled-in garden, long in the possession of the Harding- family, extending from Lorne Road down to the former Co-operative Society Stores in Cherry Tree Avenue, was known as Lady Albina Page's garden. After leaving Dover, Sir Thomas Page sold his Bartholomew Hospital lands, in Charlton and Buckland, to Mr William Kingsford, for £5,750; but the Mill lands appear to have reverted to the Crown, ^probably being then leasehold; and, in the year 1814, William Kingford bought Brox-Ditch Meadow, including the mill, from the Crown for £1,120, part of that purchase being freehold, and a small part leasehold. It would be a matter of interest to trace the history of that pile of buildings on each side of the river Dour at Brox-Ditch, but, beyond the 19th century, the details left on record of this centre of industry are few. It may be accepted as a well established fact that there was a corn mill there from the Norman period down to the erection of a paper mill. Mr William Phipps commenced operations there in 1795, but Mr Ingram Horn, paper maker, was there as early as 1777. Mr William Phipps was an enterprising man, who had come to Dover as a journeyman paper-maker, and worked for Mr Thomas Radford, the owner of the original River paper mill. He married a daughter of his employer Mr Radford and, subsequently, in the above-named year, with the financial aid which his manifest abilities attracted, took over the paper mill in Brox-Ditch Meadow; but whether in conjunction with his father-in-law’s business at River, or as an independent venture is not known. There was a growing demand for paper at that time, and Buckland was then a thriving village. The new turnpike road had then recently been made, passing this mill, rendering it a much more important property, and cottages for the mill hands had been built in the vicinity. The block of old cottages which used to stand just above Cherry Tree Avenue dated from that period, and there were others on the upper side of the mill, on the east side of the river, and others a little higher up, in Endeavour Place. A little known view of the River paper mill, in Minnis Lane, which disappeared long ago. The photograph is believed to date back about 100 years. 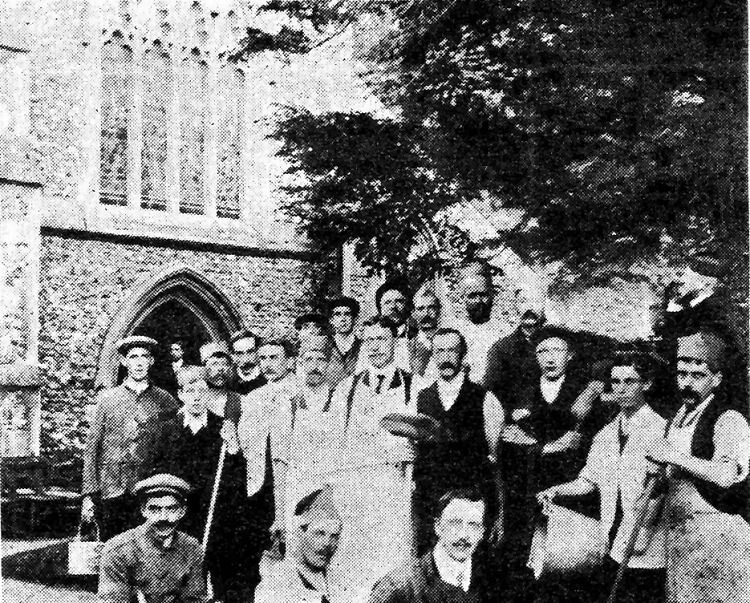 Recently printed pictures of Buckland Church and its famous yew tree prompted Express reader Mrs Dunford, of Crabble Hill, to send in the picture below of members of the Church of England Missionary Society branch at St. Andrew’s who cleaned and renovated Buckland Church in June 1910, led by Mr W. Phyllis. She wonders if anyone could identify them. Their names were not given when the picture first appeared in the Dover Express 70 years ago.